CREATIVE ZONE Managing Directors Mahesh Dalamal and Steve Mayne recently featured in the Gulf CEO Business Review 2017 Magazine (produced by M Link Marketing Solutions in association with Khaleej Times). Mahesh and Steve shared CREATIVE ZONE's business concept, their support of the UAE Startup environment and entrepreneurs in general, and how CREATIVE ZONE gained its coveted title as Dubai's largest and most trusted business setup advisory firm. Click through the slides above to read the interview in full. We provide professional and personalized solutions to entrepreneurs and businesses looking to startup or expand businesses in the UAE. Our company registration specialists assist in all the aspects related to company formation in Dubai and other emirates in UAE. From choosing the business license type, the company jurisdiction and other legal forms required for your new business. CREATIVE ZONE cover a broad spectrum of company setup options in Free Zones such as Fujairah Creative City Free Zone, Sharjah Media City Free Zone (Shams), Ajman Free Zone, Dubai South Free Zone, Dubai Design District, Dubai Multi Commodities Centre and UAQ Free Zone. Mainland business setups in Dubai Mainland and Abu Dhabi Mainland and Offshore company setups in Jebel Ali Free Zone and British Virgin Islands. Start your business journey with Dubai's largest and most trusted company formation specialists. Access our business startup toolbox now with a FREE consultation. 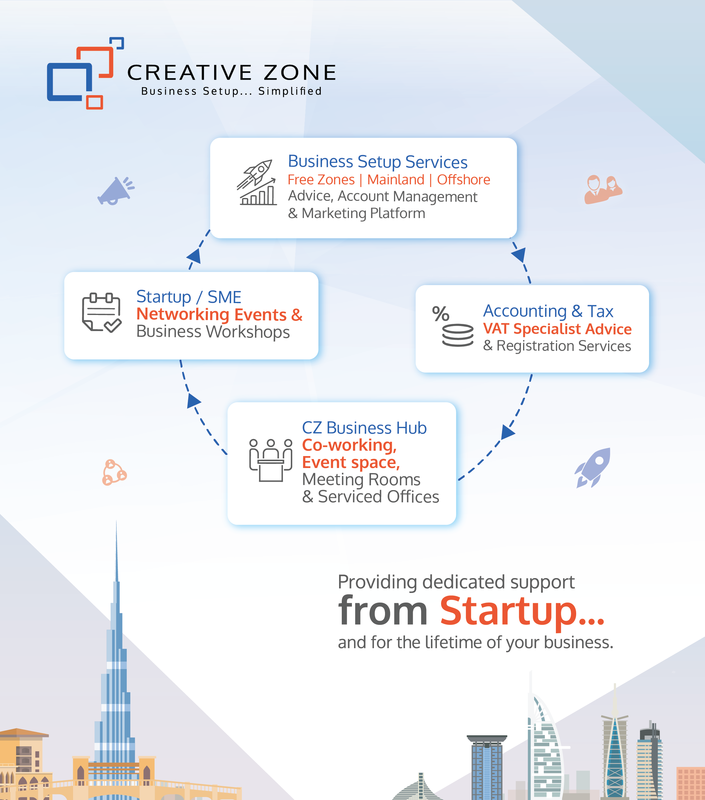 Schedule an obligation free consultation with one of our Business Setup Advisors, contact us at +971 4 567 7333 or live chat with us at www.creativezone.ae today.